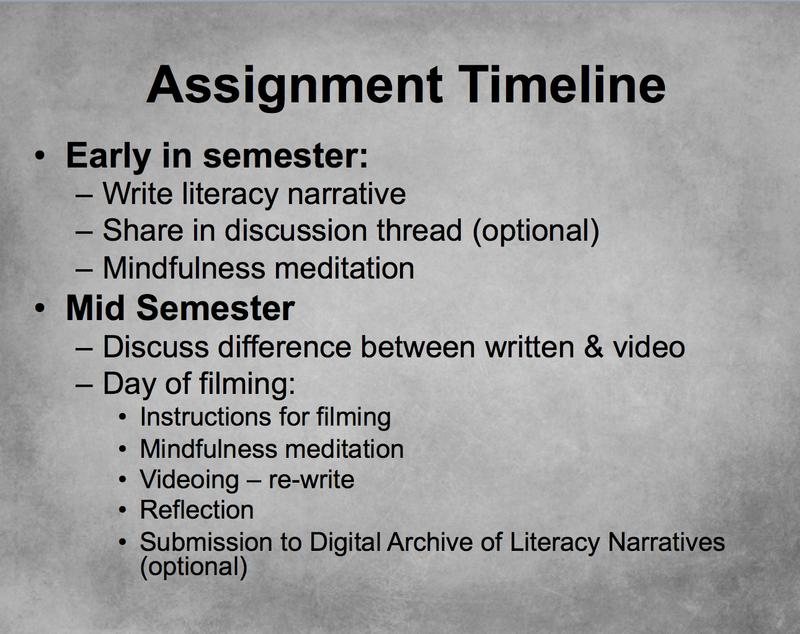 In ENGL 490 (Digital Humanities Seminar) and ENGL 605 (Introduction to Graduate Studies in Rhetoric), I assisted Professor Sharon Cogdill in facilitating a Literacy Narrative Video Remix Assignment. In this assignment, students first wrote their literacy narratives. Then, after learning about mindfulness and the effect that fear and other emotions has on their perception of their narratives, they retold their stories using mindfulness exercises and video. “Listening to both literacy scholars and everyday folks helps us understand that what is meant by literacy varies over time and place and that what we think of as a relatively stable term is, in truth, constantly changing” (68). “When we talk about each other’s papers and begin to immerse ourselves in the stories of so many others, our understanding of literacy is broadened far beyond what any scholarly text about literacy could do for us. As we read the stories of real people whose experiences are unbelievably varied, we participate in a ‘study of cases’” (71). Examining literacy narratives also encourages us to question moments in which we felt or were labeled illiterate. Fleischer explains that students can question the legitimacy of the criteria used to judge their literacy, as well as appreciate many, many kinds of literacy. Walsch echoes this point, citing an example of a student who seemed to be illiterate (according to a narrow definition of literacy) but in fact showed remarkable literacy when it came to agriculture. By understanding the kinds of literacy that our students excel in, Walsch explains, we can also help them utilize these literacies in new ways. At the same time, students receive affirmations for their strengths. As I mentioned in my graduate portfolio on transformative storytelling, we want students to recognize that they are the authors of their own stories. I believe this exercise demonstrates this point very well. In order for students to have enough self-awareness to recognize how they are framing themselves in their narratives, however, I believe students should learn to become aware of the emotional context from which they remember their stories. Fear and stress physiologically narrows our perspective to the point where we only see our own perceptive (David D. Drake 284), while resisting alternative perspectives (David D. Drake 284; Breetvelt, Van Den Bergh, and Rijlaarsdam 105). And, since emotion laden stories – particularly those around shame – tend to bring up the original emotion tied to the story, students may often struggle to see their stories differently. Even if students attempt to change the content of their stories, the emotional context of fear may remain the same. Mindfulness can help students shift the emotional context through open, calm awareness. They can also learn to distinguish the story from the emotion, making room to see it from a different perspective. For this reason, I taught students about the relationship between fear and narratives and then we talked about and practiced mindfulness. After introducing the general concept of mindfulness, I had students do an exercise in which they first called up their literacy narrative in their mind, and then payed attention to what sensations arose in their bodies as a result of calling up their stories. Mindfulness in itself can help students become more self-aware of their narratives so that they can see them differently. Video interviews, however, helps students articulate any shifts in perspectives. It can also encourage new perspectives because of the interactive, live nature of the activity. One week before videoing, we had a discussion about the difference between composing written text vs. video. With video, for instance, you want to have a fairly smooth, organized narrative to share, but you also do not want to be rigid in your presentation. The more natural the tone of your voice and body language are, the more you are likely to connect with your audience. You also need to think about where you will be looking when you do the recording. Staring directly at the camera looks awkward and can distract you as you talk. You can still look in the general direction of the camera while talking to a real person by positioning the camera next to the interviewer. 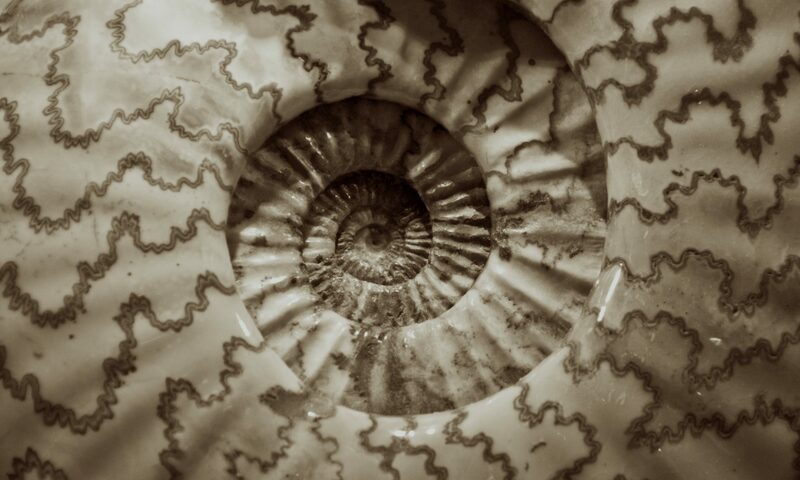 A good interview requires mindful presence from both the interviewer and interviewee. Interviewers need to listen with a curious mind so that they are ready to ask meaningful questions following the interviewee’s story. Interviewees must also remain calm enough to answer interview questions thoughtfully and reflectively. If an interviewee feels too self-conscious, he or she might rush through the question without much depth of response. For these reasons, students practiced a mindfulness sitting meditation prior to videoing. On the day of videoing, students arrived with whatever video recording equipment they can gather. Access did not pose a barrier; students were able to group themselves in a way that at least one group member had a videoing device. After practicing the mindfulness sitting meditation, students are prompted to find a space that they feel comfortable videoing in. It can be outside, in a private classroom, or even in a lounger area. Students first tell their story, and then answer impromptu interview questions from their partner or group members. Following the interviews, students return to the classroom for reflection. The overall response to the interviews was positive. Although many students expressed having anxiety leading up to the interview, for most it was not as painful as they anticipated. One common experience was new insight gained from the interviews. Following our discussion, students are encouraged to submit their videos to the Digital Archive of Literacy Narratives (DALN). In this interview, Adam explains how a second-grade teacher shamed him in front of the class for having learned something supposedly too advanced for his grade level: cursive handwriting. About midway through the interview, Adam says, “you really learn to tell a good teacher from a bad teacher after something like that.” This reconfirms William’s point that our narratives shape how we relate to teachers. It also demonstrates the power that instructors have to affect students – for good or for bad. One thing that Adam did not mention during our interview, but had mentioned a few weeks earlier in class, is that this experience made him more rebellious in his later classes. This rebellion shaped his relations with all teachers, even though not all of his teachers acted the way Mrs. S. did. His story is a great illustration, then, of the power that one experience and the emotions tied to them – perhaps particularly an early experience – can have on our later perceptions. Tristan talks candidly about how writing was a valuable and more sustainable method than substances for managing depression. Several other students, not posted here, shared Tristan’s experience; students used writing and reading to deal with depression, anxiety, and even obsessive compulsive disorder. From their stories, I believe this is a really important tool that students sometimes stumble across, and are not necessarily taught. These stories reveal that both reading and writing can help us see our own stories differently. For further discussion on how reading transforms our self-perception, I recommend learning about bibliotherapy. For further discussion on how writing transforms our self-perception, you can learn more about narrative psychology, which I discuss in my Transformative Storytelling EBook). I also really appreciated Tristan’s honesty in talking about substance use. In ENGL 490, using substances came up during our discussions on the using mindfulness to understand our narratives. Students recognized right away that to write requires a particular mind state. While I offered mindfulness and other mind exercises as a tool to bring about this state, I heard one classmate whisper to another from across the room, “drugs.” I used this as an opportunity to talk about drugs as a large group (Side note: I said “did someone just say ‘drugs’?” to which the whole class laughed and the student who had whispered said, “wow, you have really good hearing.”). Without condoning substance use, I believe (especially with a group of seniors) that this topic deserves discussion. It was clear from several students’ responses and comments that students sometimes do use substances to be able to create or write. As senior English majors who wish to become professional writers, I am concerned that those who use substances on occasion to write can become highly dependent. It also want to make sure that students are aware of alternatives to changing their mind state that are not harmful to their body or mind. Again, I offered mindfulness as one such tools, but there are other tips. In fact, through a brainstorming session, we were able to come up with several tricks for getting into a creative mode. Later in the semester, we brought in a panel of current and past graduate students who also offered advice for accessing creativity, such as jogging, cooking, and giving your writing space. Tony’s literacy narrative raises several interesting questions: what effect does punishment have on literacy formation? Are repetitive drills generally helpful in terms of developing written literacy, or does it depend? What caused Tony’s “literacy puberty” – the spontaneous shift? From Erin’s story, we can see the value of the literacy narrative in terms of offering an opportunity to reflect on what helps us learn, and what kind of learners we are. In Erin’s case, she realized that she learns very well kinesthetically. Since Erin brought up learning styles, it is mentioning Kolb’s Learning Styles and Experiential Learning Model, which basically says that the brain needs to process new information in multiple parts of the brain in order to be fully integrated for learning. This raises important questions for instructors in Writing and Rhetoric: how can we accommodate multiple learning styles? Most college classes require that students sit for long periods of time, suppressing the body’s need to move – what does this do to students like Erin who thrive with kinesthetic learning? Could we integrate yoga or gentle stretching into the classroom, and how would this affect learning? Jon, who is fluent in several languages, talks about how learning different languages made him conscious of and changed the way he viewed his native language. He also talked about the difference between knowing a language and actually being able to use it in a place where the language is spoken. I’ve had a similar experience when after two years learning German in high school, I participated in a foreign exchange program in Germany. This experience also taught me to have empathy for non-native speakers, for which I have a great deal of respect. Another student, who I will call Student K, did not feel comfortable with my sharing her video here, but granted me permission to talk about her narrative and her videoing process. Student K’s narrative compliments Jon’s very well because she talks about what it was like learning a different language. In her video, Student K literally showed her audience how she learned to read. She brought out her “Babysitter’s Club Junior” book and showed how she would use a piece of paper to slowly reveal one word at a time. For each word, she explained how she would call up an image and reflect on it. Then she would move to the next word, and imagine it. After finishing one sentence, she would put all of the images together in her mind and make sense of the whole sentence before moving on to the next. Since I was her interview partner, I asked her what it was like reading academic articles in English versus elementary books. She talked about the difficulty of visualizing words that are more abstract. After really seeing her learning process, I had a much deeper appreciation for how challenging it is for non-native speakers to learn in a non-native school. I asked if she ever considered google-imaging abstract words as a way to visualize these complex words, which she considered trying in the future. Other than this suggestion, I really wonder what other resources are available for learning high-context, academic language.